Fear as a human emotion, is actually there for good reason. It prevents us from things that may harm us. While singing is not actually harmful, the social fear of rejection is often what our body and mind object to. But fear of singing can also serve a useful purpose, in telling us how important music is to us. Fear before a concert can help us realize how important doing a good job is to us. It can also tell us if we haven’t prepared well. Many peoples’ fears in music come from a lack of control. We are afraid to sing, because we are uncertain about what sound might come out of our mouths. We are afraid of poor tone, of voice cracks, of running out of air, and a myriad of other problems. And yet, the only way to mitigate these problems is to use our voices. In every other instrument there is the expectation of a learning process, and yet with our voices we believe we either have a good voice, or we don’t. This is a fallacy. Allow yourself time and space to learn to use your instrument properly, and you will start to see great results! One of the best ways to get over a fear of singing, is through a positive support system. An introduction to singing through choir is a great way to accomplish this. Because choir is a community of like-minded people, whose voices are stronger together, singing in a choir takes a great deal of pressure off of the individual. Choir is also social, and we are much more likely to try new, and difficult things, if we feel we have strong social support behind us! 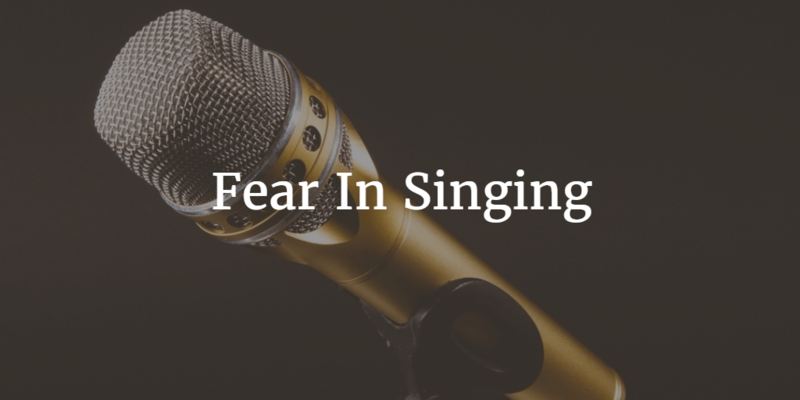 How else can you combat fear in singing? Tell us in the comments below!